Fowey Consols is a mine whose history dominated the fortunes of William West and J.T. Teffry. This was mine in mid-Cornwall was where their lives first crossed, and where they built t heir famous Austin’s engine. Fowey Consols was an amalgamation of several mines, and this can make following the history of the set confusing. 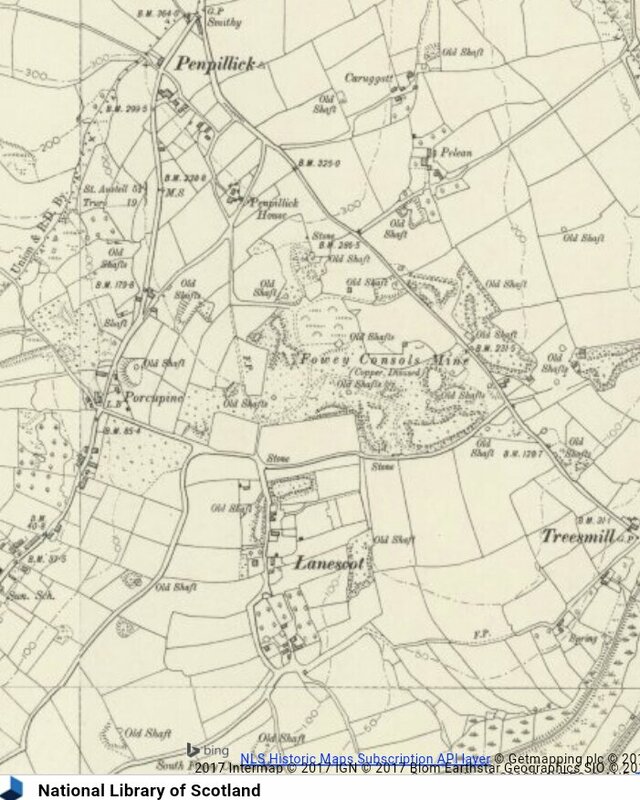 This post therefore combines the information contained in Jim Lewis’s book ‘A Richly Yielding Piece of Ground‘ with excellent National Library of Scotland website to explore the sett. The Map from Jim Lewis’s book on which this post is based. These all started work in 1813, they all became Fowey Consols. in 1822. This became part of Fowey Consols some time after 1830. This opened about 1817 but did not join Fowey Consols until 1836. Austen’s involvement in the mines started in 1814 when he purchased shares in Treasure, Fortune and Chance. The mines had a slow start, and the early history of the setts is a complex one of debts, closures and disputes. In 1820 Austen gained control of Wheals Treasure, Fortune, Chance, and Hope. He was was also buying shares in Lanescott. Fowey Consols was formed in 1822 but Lanescott remained a separate Company until 1836. The total production of copper from the mines between 1815 and 1836 was 383,359 which brought in sales of £ 2,247,478. Fowey Consols was more than a return on investment, to him it gave him chance to make mark in the world. A list complied from Annex V of A Richly Yielding Piece of Ground. 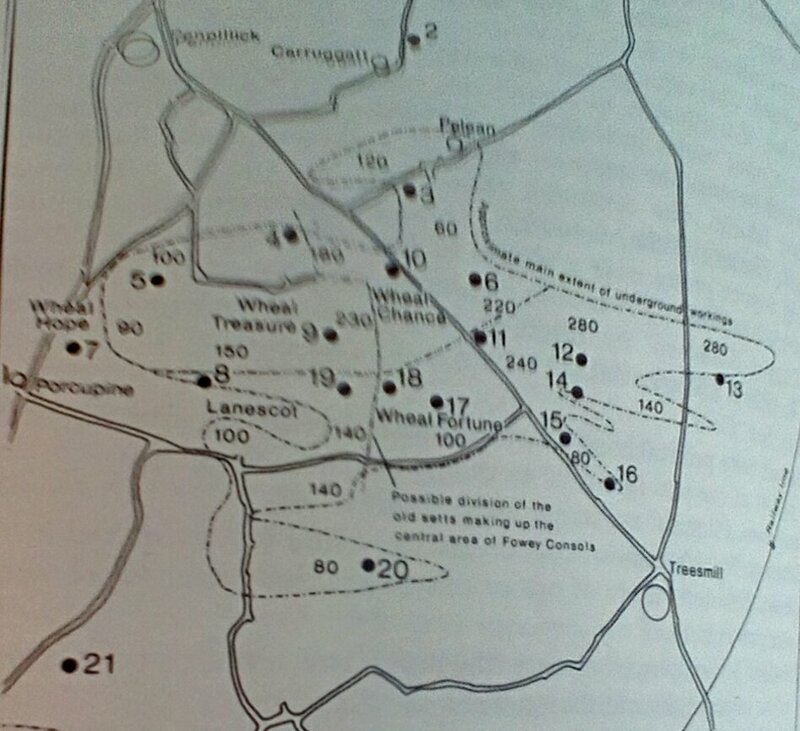 The numbers relate to the shaft positions shown in Jim Lewis’s map, the dates refer to the period of the engines operation. Next post…the aftermath of Austen’s engine trial…. My mining gg grandfather (a John Watters) left St Blazey for Camborne in the spring of 1862. There was no family reason for this move to my knowledge so it must have been due to work. Did Fowey Consoles and other mines around Tywardreath (don’t which mine he worked in), start running down by this time?